Aloe Pura Advanced Action Colon Cleanse Tablets encourage better internal transit overnight, gently and effectively cleaning your digestive system from the inside. The clever combination of natural herbs and plant extracts, including Aloe Vera Leaf Powder, Senna, Fennel, Liquorice and Dandelion all work collectively to ease feelings of tightness, fullness and bloating. 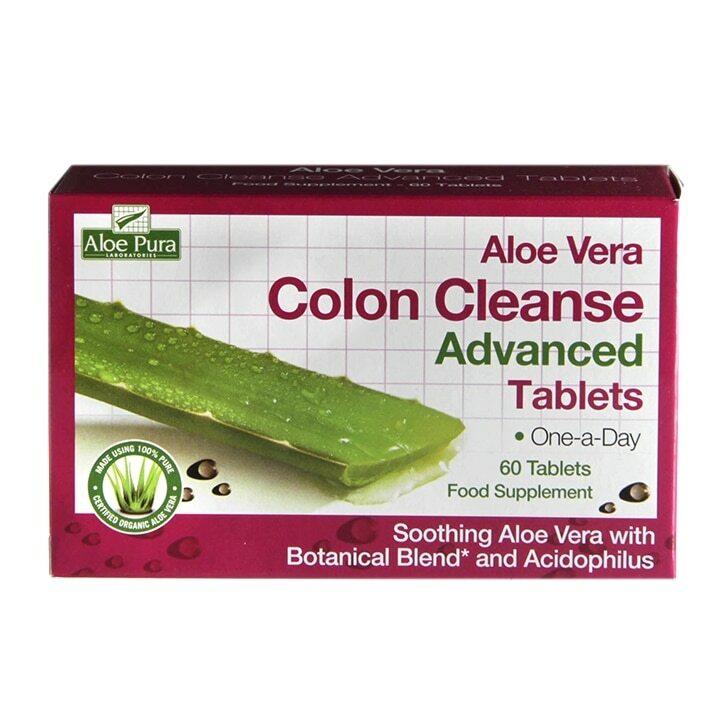 Aloe Pura Advanced Action Colon Cleanse Tablets work well as an occasional solution, and support digestive regularity. For gentle overnight cleansing, take 1 tablet (vary quantity according to experience- maximum 4 tablets daily), before bed. Do not exceed stated dose. Food supplements must not be used as a subsitute for a varied diet and healthy lifestyle. Bulking Agents: Microcrystalline Cellulose & Dicalcium Phosphate, Aloe Vera (Aloe ferox) Whole Leaf Powder, Cascara (Rhamnus purshiana) Bark Powder, Alder Buckthorn (Rhamnus Frangula Bark) Powder, Senna (Cassia angustifolia Fruit) Powder, Aloe Vera (Aloe Barbadensis) Juice Extract 100:1, Aniseed (Pimpinella anisum fruit) Powder, Fennel (Feoniculum vulgare, Seed Powder, Gentian Root (Gentiana lutea root) Powder, Liquorice (Glycyrrhiza glabra root) Powder, Mallow (Malva sylvestris leaf) Powder, Peppermint (Mentha piperita leaf) Powder, Rhubarb (Rheum rhaponticum root) Powder, Rhubarb (Rheum officinale root) powder, Dandelion (Taraxacum officinale root) Powder, Anti-caking Agent: Magnesium Salts of Fatty Acids (Veg Origin), Silicon Dioxide, Lactobacillus Acidophilus. Gluten, Wheat, Milk or Lactose. No added sweeteners, artificial flavouring or colours. Suitable for vegetarians. Do not exceed the stated dose. Not suitable for young children, during pregnancy or whilst breastfeeding. Do not take with any laxative medication. Aloe Pura Organic Aloe Vera One-a-Day Colax Tablets is rated 4.3 out of 5 by 63. Rated 5 out of 5 by Dots13 from Very good! These tablets are very good. Easy on the stomach, I take one tablet two evenings in a row twice a week. Only thing i would say is don't take too many (I believe you can take up to four!) , start off slowly. One tablet at a time is enough for me. Expensive, but I cant recommend enough. Rated 2 out of 5 by V White from OKAY I bought these expensive laxatives based on the many good reviews, I read. For me, they did not live up to expectations. They worked okay, but no better than my cheaper "go to" laxative of choice, with Senna, as the main active ingredient. I needed to take 4 tablets, in order to experience any noticeable effects. Iwouldn't buy this product again, nor would I personally recommend it.